CAB Kicks-Off Coffeehouse Series and Introduces Mug Club | The Gettysburgian. Abe Parker performed at the Junction for the first Coffeehouse Series event of the semester (Photo Mary Frasier/The Gettysburgian). Nestled between Commons and the Bullet Hole, the newly renovated space known as the Junction has been furnished with comfortable chairs and tables, outlets galore, and a brand new stage for live performances. 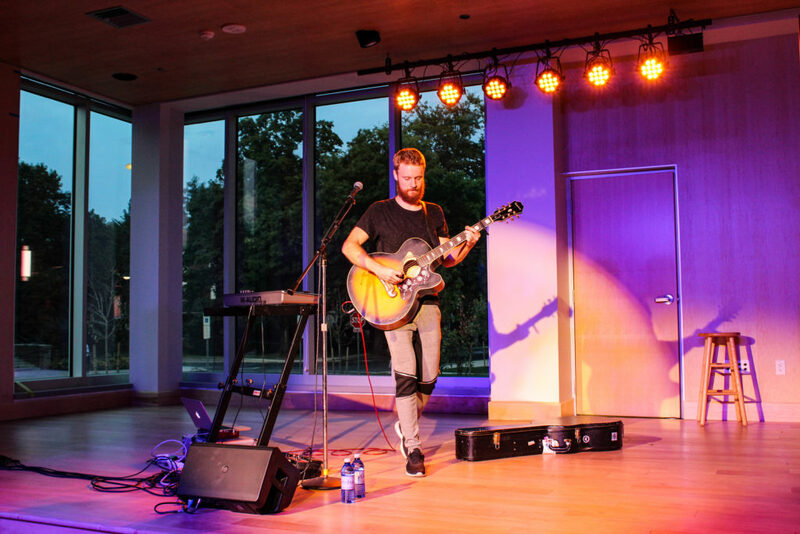 On Thursday, September 6, the stage was broken-in by singer-songwriter Abe Parker, as part of the Campus Activity Board’s new Coffeehouse Series. As Parker continued to play, more Gettysburg students filed into the space, with applause coming even from students in Bullet after the end of each song. The CAB-sponsored Coffeehouse Series is in collaboration with the Mug Club, a new opportunity for students on campus. Mugs that have been handmade by a local ceramic artist will go on sale during the first week of October, and for $30 each, members of the Mug Club will receive a handmade mug, $0.75 off all drinks at the Commons, and a free specialty drink created for each Coffeehouse Series performance. Parker then launched into a string of acoustic covers, including Nat King Cole’s “LOVE” and “Blackbird” by the Beatles, followed by an original song, “Cali,” which he wrote about his friendship with a homeless man whom he helped begin the process of rehabilitation. The man, named Cali, got in touch with Parker a year ago to let him know that his life had turned around for the better and that he is now serving as a youth pastor. Parker ended his set with a cover of Bill Withers’ “Lean on Me,” which was greeted by applause, and said goodnight to the audience. Esmeralda Orndorff ‘22, said she “really enjoyed the performance” and would “definitely come to another,” also noting that it introduced her to a “new place to study” that she otherwise wouldn’t have known about. Her tablemates, Grace Gallagher ‘22 and Haley Bechtel ‘22, shared similar sentiments, with Gallagher adding that the performance was a “nice break” from a hectic first couple weeks of classes.